Snorri's Edda. Carl Dennis. Charles Atkinson. Corey Marks. Franz Wright. Gary Young. The Gawain Poet. Rainer Maria Rilke Richard Hugo. Robert Bly. Sara Teasdale. Shiki (haiku). Snorri's Edda. Stephen Dunn. Ted Kooser. W.S. Merwin. David Lehman's Introductory Essay. Heather McHugh' Introductory Essay. Selection criteria. Poets. First publication for poems. The Best American Poetry 2007. 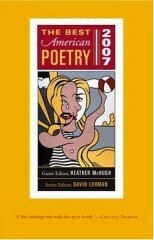 The Best American Poetry 2007 begins with an essay by the series editor, David Lehman, introducing this year's guest editor, Heather McHugh. McHugh writes untranslatable poetry full of English-specific word play. As a result, the issue has a lot of unusual poets and poems for BAP. It turns out to be one of my favorite issues! Selected Heather McHugh as the 2007 guest editor. Defends the legacy of parody in poetry -- in anticipation of the many parodies in this volume. Lists Heather McHugh' credentials, including her "cutting elegance against glib and simplistic poems by well-meaning citizens. ... Against that tedium, a little unholiness comes as a big relief." Proclaims: "I favor both kinds of poems -- the kind that celebrates and the kind that criticizes." Proclaims: "I believe, with Wordsworth, that the poet's first obligation is always to give pleasure, and I would argue, too, that a poem exhibiting the comic spirit can be every bit as serious as a poem devoid of laughter." Argues there is: "a dangerous if common misconception that a political poem, or any poem that aspires to move the hearts and minds of men and women, must be reducible to a paraphrase the length of a slogan ... [But] We want something more complicated and more lasting from poety. ... Real poetry sustains us." "As soon as systems of words are wielded by intentions only, predictable and paraphrasable, they begin to bore me. A logophiliacal hunger craves amazement. And words can blaze! -- most brightly when (like fire) their logs are interlaced with airs. They can flow -- or flock -- or fluster." "Poetry cares for the means of the meaning business." "I am told that the Haida use the same verb to mean both breathing and the making of a poem." "Poems in this present volume originated in relatively conventional print and online journals. They have in common their having moved me." "Convincing curves and conversations emerged, and some of the poems I had originally chosen turned out not to have a place in the upcropping forcefield. Uncanny links became apparent." Denise Duhamel's hilarious "Language Police Report"
Brad Leithauser's "A Good List"
Alan Shapiro's "Country Western Singer"
Rosenberg's poem is in her first and only publication, in "Hanging Loose." At first publication, she was 26 years old. Copyright © 2007-2016 by J. Zimmerman, except for quotations.